Alrit guys, I’ll be spending the coming week in HK, a long due vacation I say. Birthday celebrations @ Macao, yo baby its gonna be gambling, drinks & girls 😉 all night and sky diving in the day!! One heck of an adventure is in the making! Will keep sharing my experiences with you guys. While programming an add-in for Excel 2010, I suddenly realized that I was no more able to automatically fill and drag-drop cells. In excel, when we select a cell and move our mouse to the border of that cell, the cursor changes and it is using this through which we can drag-drop or auto-fill but in my case this stopped working. After exploring a bit I found out how to enable it again. 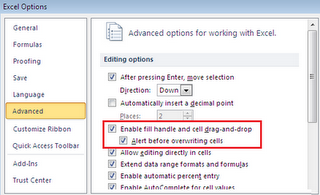 Click the Microsoft Office Button, click Excel Options, and then click the Advanced tab and then Select the check box that says “Enable fill handle and cell drag-and-drop” and if you want to be alerted before overwriting an already filled cell then Select “Alert before overwriting cells” too. The blog is now publicly available at http://lordakshaya.com. I am also looking to make my blog available through other domains, if u have any suggestions let me know! OK, that’s it. So much for the return of the awakened blogger. Apparently, my blog is not one of the active blogs or I may say it not in the league of blogging too. But I have made a decision and the decision is that I’ll begin to consistently post in my blog about the various events that I come across, tech information and life experiences. Stay tuned!